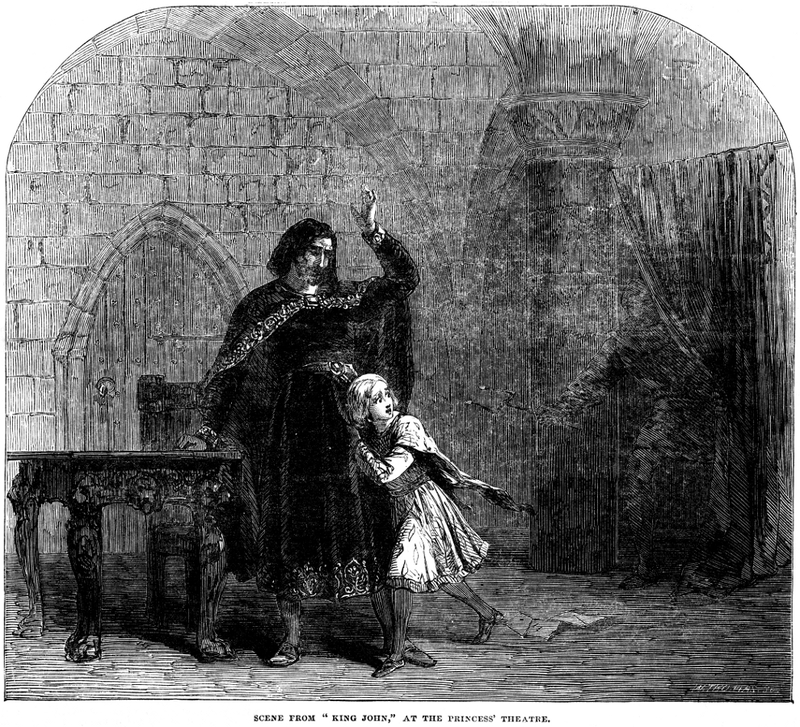 Scene from King John, at the Princess' Theatre. these are the national marks, which present John to us as a representative personage, bearing the yoke of his time and vicariously suffering its evil as his own. To us this picture of regal sin and suffering has a deep meaning and moves the reflective soul to intense emotion. Shakspeare [sic], in his rifacimento of the old play, evidently felt all this; and added to the natural pathos of the story by the exquisite snatches of poetry with which he adorned the original meagre dialogue. The subject was worth his writing up, and he performed the task con amore. Witness the fine touches which he has thrown over the prison scene between Hubert and Arthur to which this week we have devoted our illustration. Even the conceits with which this colloquy is overrun only serve to set forth the innocence of childhood in a more affecting manner. Perhaps the character of the Prince was never more beautifully interpreted than by Miss Kate Terry, whose exquisite acting at Windsor Castle in the part much pleased her Majesty. Of Mr. Ryder's Hubert, with its rough pity and manly devotedness, we have said sufficient on a former occasion. To those who have witnessed the performance, our illustration will prove pleasingly suggestive, and they will value it as a record of an excellent example of really fine, natural, and powerfully pathetic acting, in one of the most distinguished of Shakspeare's [sic] situations, marked with some of his best points and irresistibly commanding the sympathies that are strongest in the noblest. Such dramas are calculated to make the spectator brave and good.